The CGOA Masters Committee is pleased to announce this year's CGOA Masters Day to take place at the Knit & Crochet Show in July in San Diego, CA. For more information about the Knit & Crochet Show, along with the CGOA and TKGA classes and events, please visit this website: http://www.knitandcrochetshow.com/. 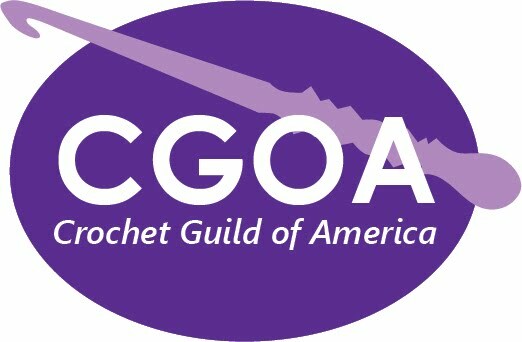 If you’re currently enrolled in the CGOA Masters program, would like to learn about the program, or simply want to take your crochet skills to the next level, join us for a full day or half day of information specifically targeted to enhance basic crochet skills and skills necessary for the CGOA Masters program. Topics covered will include: organizing your Masters notebook, getting gauge in rows and rounds, yarning over correctly, weaving in ends invisibly, joining smoothly, fastening off neatly, reading your stitches, foundation stitches, blocking and more. We’ll also be reviewing swatches in the program to teach you how to review your own work and we’ll explain what we’re looking for in the portfolio reviews. Supplies to bring: Swatches for informal review, portfolio in progress (or finished), swatch(es) for blocking, worsted weight yarn and crochet hooks. Homework: Write down your questions for the CGOA Masters co-chairs and portfolio reviewers. Make any swatches from the program that you’d like to have reviewed onsite. We hope you'll take advantage of the 2015 CGOA Masters Day and all that the Knit & Crochet Show (CGOA Conference) has to offer!